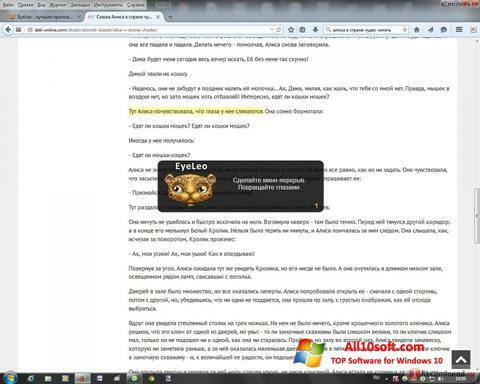 EyeLeo for Windows 10 helps all the fond of sitting at the computer at the expense of vision to develop self-control. Cute leopard forcibly blocks access to a laptop and shows exercises for the eyes. Such exercises will allow to rest, relax, it is useful for the nervous system. In total, the application provides several breaks: small, large, instant. The latter is selected by the user in the drop-down commands menu. The first lasts 2-3 minutes, the second - 5-7. Specific parameters depend on the settings. The program does not take up much space, does not conflict with the rest of the installed software. You can free download EyeLeo official latest version for Windows 10 in English.